I will keep drinking tea, being somewhat addicted. Besides I can't stand coffee anymore. I probably shouldn't drink the tea either but I do love it so. So many different varieties, subtle flavors, and marvelous smells. It always helps to calm my more troublesome thoughts. Do you suppose if I did drink the ink it would make my thoughts indelible? Perhaps writing with tea might also have interesting results. What kind of haiku might be produced with a cup of Irish breakfast? I have nothing new in this book at the moment, but there is one new poem in Vol. 3 "Autumn Clouds," that I will share with you. Anytime my wife gives me a new book I like to place a new verse in it before I finish the last book. Cutting the darkness with a brush. First day's rain on his robes. This night after Gotan E.
When the gate sign was posted? To leave the temple grounds. 18. The cats surround us. And give it to Amida. How can he see me when I am not here? As the first snow falls. And a nearby wren's song. There's the start of the new book. The shade beneath the willow. And not disturb the scene? That he chants nembutsu too? I bow to their natural wisdom. Bringing grasses from the lakeshore. I am finally back on track. Nearly caught up with answering personal mail after vacation. Anyone I haven't responded to yet, I haven't forgotten you. I am getting to things slowly but surely. In the meantime I am taking a relaxing break to send out a few more poems. Papa tree swallow eats some seeds. And delighting in bird songs. In flower fields in the Pure Land. Skip stones on the lake. Trails off . . .
On the shore of samsara. And a fresh pot of tea. As the old self dies. I dry my wet sandals. For the grace of Amida. for a bit to end the night. An old priest doesn't care. And heap abuse on my head. No visitor kicks them aside. Or is it this old priests? Cherry and apple blossoms on the shrine. Would find instead a tombstone. As I put ink to paper. Flaps his sleeves as he runs. The birds and I know better. That my day has changed. Or vanish from this world. Fell over and washed each other. That's it until the weekend. Time to go off and write some more. I wrote a few new verses this evening but somehow I still feel like writing more. Hope you enjoy a few of these. When I journey at last to the West. Why Bodhidharma came to the East? He did and here we are. Until my broom comes in sight. They scatter and call insults. 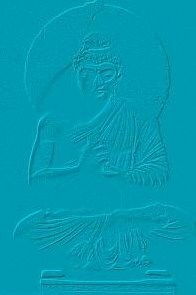 Their nembutsu humbles the moon. A song of drunken Dharma. Opening the shoji to view the moon. 141. Sick of broken handled brooms. To chase crows and monkeys. 142. Free to stand forgetting mind. 144. My original face has no features. It makes a passable meal. 147. Thirty blows with a wet tea leaf. Just one flattens my Master. My fears crushed in my hand. I may swallow it next. Quiet, the tea is steeping. 150. Tea dust and a big Kwatz! The Patriarchs hidden under my robes. Thank's all of you again for your support. I shall keep on writing as long as I can think of something to put down on paper. It's usually just a matter of lack of time that keeps me from doing so. I am nearing halfway on this current volume, slowly but surly making progress of one sort or another. Who can say? Zen oar in the water. Call the Master with a bucket! How many pieces of Kaika Buyo. My original face will do just fine. Was hit by his own thrown nut. 161. Out of my grasp the turtle's head. Looking sternly at my student. 167. Mt. Sumeru reduced to dust. 168. Farewell ! Farewell ! Squirrel giggles, holding a teacup. If they knew it or not. The circle of Zen stands complete. With eyes open and dirty hands. Tasogare Shinju stomping up and down. Shatter the iron monkey ! It seems a good night for haiku. The rain just swept in behind fierce winds, hiding the moon, and whistling across the lake. Now all I need is a fresh pot of tea to watch the night skies. When I change hats ? When I went out ? What did you see last night ? Waking, I was gone too. Music in a cracked bowl. They've found me out ! Pointing at an empty head. As I watched it ? All they can do is rain. The sight of angry clouds receeding. As a small gray squirrel passes. To calm an old priest. I thank you all for allowing me to share these poems with you. They have taken my mind off the flu I am fighting off and it's wonderful high temp that goes with it. Ever so briefly they have taken me to another place where peace of mind dwells and illness is nonexistant. I caught it for a moment. As I leave the temple. 205. Summer refuses to come. Days pass, but only rain. A quiet visit and tea. Fixes a student in place. I once heard . . . . . . The Zen boat is not there. An iron stick is dead but alive. On a horse with three legs. To know where they are going. Though this body does not exist. While my feet get blisters. My empty mind goes nowhere. Would be a waste of time. Dog Dharma or cat Dharma? Where did the monkey put his coconut? And a million worlds of delusion shatter. Frosty bamboo in the morning. Don't need me to grow. And who is reading it. Can upset my late night tea. 247. The frogs are singing. I laugh at my mumblings. But we do not notice. As my robes grow sodden. I finally see the wiseteria, oh no! That it was not alone. And returned as an octopus. To share cool breezes and tea. That is his true memorial. Above the breath of the wind. The passing of my dry head. Unable to see or hear. 278. Tea beneath the full moon. Of an old familiar ghost. When you enter the temple. Other than to have no desire. I am not always myself. Blown to the world's four quarters. Which head will drink it? That I will never know up from down. I laugh at your constant snoring. 288. That let the Katsu ! Can ever put it back again. 289. How can I depart while sleeping? While snoring it is a certainty! That it clears the Path. 291. The moon flies by so swiftly. Harvesting cobwebs with my broom. Who knows where it will end ? And carve your own tombstone. 296. Change has passed me on the wind. 297. What matter my 48 years? I have put down my brush. And finally have the wits to know it. 300. I never sat beneath the moon. No I walked out to sit. In the end it's all the same. Well, it's off to work with me. Enjoy your evenning. Like the dew on the flowers. Where we two are drifting. 307. My dream was so sad. Which was the true dream? The cuckoo brought a smart monkey. 315. I am still here. I bow to the rising sun. I sit with the new moon. When the bells shatter a frosty night. Smells of the far shore. I have left nothing to chance. As there is no time. Is no place to tarry. On my way I go. The race to die comes closer. Tells me I am right. The line between here and there. Will the grass be long or short? As I turn and follow the Way. We shall truly wake up. If you too feel Amida's smile? What a joy to truly meet you. Time passes and "I" is not missed. While my mind was elsewhere. I will just be here. Covered in wind blown leaves. I watched the night sky. Like the koi beneath the Winter ice. I decay more while smiling. I Awoke from my sleep. I plainly saw tommorow . And flowers on the beach. And the tea has escaped. Flee from the face of the moon? To find it's true self. Which way to the teahouse? Time enough for a long walk. Will soon have me hopping. What fun I had with that. 370. Emptiness is just another change. The way it was cannot be. The color of the wind. Even the illusion of dew is an illusion. I welcome such a song. No bird calls. No shadows. The temple is most peaceful. The battle was already old. I sweep the cobwebs away. 384. Red leaves and sky. For there was no loss. A billion lies and delusions. So what was done here? Cannot be Spring or Fall. My dreams grow and fade. Gives and takes with time. 408. A blink and time is severed. Not seeing past or future. 410. Talking to myself again. I hope I answer wisely. 412. I might get up. To be calm and useful. I yawn well as I open the temple. You would have had it anyway. While my neighbor does the same. A surprising sunset each night. Bespoke the wisdom gems within. Each day is a treasure. Nor cause me to fear. I am wiser than others. It will all come about. I must remember to turn the page. But my Master on the far shore. And they have gone nowhere. With the rest of the dead leaves. Just tea and Autumn treasures. On my sandals to clean off. 436. The day begins with rain. 438. One of my heads disappeared. No dust on this old head. Don't bother to bury the other. It would talk you to death. With the goal in sight. Of tea, or mind with time. But sometimes my legs are lazy. For the lessons he gave. I continue to study as if he were here. When I speak to you? 447. For me Autumn is like Spring. I hope you find some small worth in these poems for your own enjoyment. Here's hoping one and all are well and happy. I have finished this volume within the last week and am well into the next. There are quite a few left in this volume to keep you all reading for some time yet. Surely he must be enlightened. That holds a grain of sand? Or rain obscures the moon? New and old/old and new. If you care to listen. I won't have to repeat myself. In the midst of his last word. I can laugh at the outcome. Neither of us hears the surf crash. With a volley of laughter. Until then the Buddha naps. As he cooked the rice. Remains tied to the wharf. All right in no time. No use to watch for him. No meaning in his absence. Comes from an old turtle? Grew out of the old turtle's shell. It must always be today! 524. I heard what you said. Throw crumbs to the birds. When you have a set of your own? May you find something enjoyable on this early Tuesday morning. It's been quite awhile hasn't it? Things here have been hectic to say the least. Everything from an electrical transformer fire that left us without power for days to serious kitty illnesses and deaths (as well as introduction of two new kitties to our horde, now numbering ten). Mitted seal point Ragdoll Cecil at five years old and black an white 12 week old kitten Bertie Jr. have come to live with us. Passing away quietly at the vets was 7 year old Burton. Our garden is up and running with multitudinous flowers, strawberries, lettuce, and tomatoes this year. 551. "Give me a clue," said the student. "Water in the kettle, rain on the roof,"
Replied the stern old Master. "Life or death. Don't try to deny it." 552. Alas! But so what ? But his bed is still slept in. Yet never falls in the mud. Too many flies in your bowl. That old Risu swallowed the universe. When he spits you back out. Saved me a lot of blows. That smile of the old sensei. The old priest felled many tigers. Another deceased old fox coughed. I am just like that. I can truely say, "good morning." 564. Do you have water in the bucket or not? And fill it for you? One more frog in the pond. You can't eat what I ate. To stir the cooking pot. A pickled radish that way. 569. Don't take this dead fellow away. He can still teach something. He can go up and down. Three great steps. Over the cliff! 570. Cool breeze through the bamboo. Birds flying south at snow fall. And scoop frogs from the pond. Don't trip over the new oaks. I've shaved the tiger's whiskers. A cow must be very healthy. Someone let the cat out. As he turns the corner. What is the temple coming to? Yet my shadow blocks your movement. Banged his staff on the turtle's shell. 579. Nothing under the covers. Risu's nose smells the opening. Sweep them up like only you can. Unless it becomes a cat. With the rest of the dust. Comes to land in the circle. Scratching in the dust for a petal. The moonlight spills from his eyes. When so many were frightened by his shadow. No need to tie it off. At noon it's still dark out. 594. Have you ever seen old Risu? 595. A student asked, "what is the Way?" Risu replied, "Duck Zen is popular." "No such thing," said the student. Really sticks in his throat. 597. The unknow cancels out why. 598. Traveling from place to place. After all where am I? I forget to grasp the moonbeams. The moment they exit my mouth. Funny I never noticed before. Cut off the tounge and the head still screams. 600. Master came by carrying an urn. His student pointed to it and said, "Buddha!" Master smiled and replied, "wrong Buddha." 601. One monk went uphill. They tripped on their tounges. And your head nods in sleep. Old Risu takes a vacation. So don't try to speak to it. The better to see the ground. Is not seeing the mountains. The clouds break their silence. 607. No rice on the stove. When your mind is gone? Just don't choke on the decaying leaves. Runs in fits and starts. But I still need to eat and drink. Old Risu never walked a step. But he knows what he's about. You get leaves on your head. At the bottom of a frozen lake. Will never get you there. I can say something or nothing. You might perceive the echo. As they do their grisly deeds. Tozan didn't use it up. And down old Risu's throat. He glowed in the dark. Yet he just sits drinking tea. Risu danced in the roadway. Or eat it as it is? Old Risu slept all day. And you are alive again. The tang is ever sublime. Too many thoughts of life. Flying farther from your birth. The road goes straight both ways. Lands on the far shore. 647. I must be getting senile. My first student a priest. Shaking my rake at the leaves. How can I disturb them? They've done nothing to disturb me. As twilight steals across the sky. While I brew green tea. Autumn knocks on the door. It may not come again. All coming to a head. As I prepare your vows. At one with each snowflake. Will I scoot into next? Taking in the pink sunset. And still it is amazing. Unless its priest is about. Has gone missing this Autumn. It cries out in vain. The mirror showed their end. Dared to show its face. Each day when I rise. May see it as I do. As he stood on the horizon. The mountain that is no mountain. 677. The alarm goes off. Afraid to hear the morning bell. 679. Bringing in the new year. Who took out the old? Crowd the temple to bursting. 683. Why don't you get lost? Carry it in a bag. Don't lose it, don't gaze at it. See what should be seen. 687. Don't jump in the bath with me. Then your dirt will vanish. Mu in an empty barrel. Hung you from the temple rafters. All the gates are open. As the sun and moon rise. 691. Master Dokyo Chozen knew nothing. Which ultimatly did not produce me. Drink a cup of tea Dharma. Used to teach smiling Dharma. Brings me back to him. 693. No cheating my teacher in his own house. So now I cheat myself. I'll finish my own rice instead. 697. "Where is the living Patriarch,"
Said old Risu tossing orange peels. "What sort of Dharma do you teach sensei?" ""Drink a cup of tea." When it is up and down? Old Risu always knows them. Told me a good story. Bodhidharma's coming from the West?" Stop looking at me like that!" "Frog in the flour bin." "What does that mean," asked a student? Old Risu replied, "you wouldn't understand." "Tell me what to do next." "Join the frog in the flour bin." "Is there a Bodhisattva around here?" All day long I hear you say. "Plates fell off the shelf and broke." 714. Each Dharma is a turtle. 715. Waves never strike a Bodhisattva. If you go to the beach. 716. Full of rice and tea. "That crap smells like a lotus." No one could see the enlightened flies. By a boiling tea kettle. It took them by surprise. Never failed to do his laundry. Best kind of people in there. Have tea, or fill in the old outhouse. And hear the lion's roar. Keeps them out of my hair. Shaku Egan thanks for the note and the encouragement. No, I never have thought of printing my work, outside of the website anyway. If anyone ever wanted to publish them I might consider it. Yet is not really why I write. That is totally just for the bit of happiness and light the poems may bring to those who read them is more than enough for me. It has been awhile. Lots to do and too little time to blame I am afraid. Now on a weeks vacation I am playing catch-up all the way around. I hope a few small verses might lighten the load laid on everyone by the events of the past few weeks. Of honey you would eat it. Throw Buddha in the trash? And clean up the mess. Kicking you is all that's left. He should know what's coming. The Master licks his fingers. "See, I told you so," he said to himself. He just gets older still. Topped with all the dead Buddhas,"
And still speak to you? Shaking his fist at his students. Is in the frying pan. "Add the rice and vegetables." 737. One gain, one loss. Which fills the cup more completely? By his tail from a tree branch. Will you hang beside him? What the dust Buddha is up to? Or advance, where are you? To tie your shoes for you. From the floor just fine. Don't you blow your nose? Go away! Do you see? 746. Monju stands for principal. Who is it that sits down? Both correct and both wrong. But inwardly he is still. Did it look the same? Enjoy and be well in mind and body. 776. You like bird's nest soup. I like sushi and rice. Can even find the door. The cushions are all occupied. I will not venture to say. I can hold my thoughts in my hand. Leaves whistle in the wind. 784. My day starts anew. Rising I stretch and yawn. 787. Snow on my shoulders. And listen to the rain. In the wind of night. For your gift in death. 807. Leaves think nothing at all. 811. I have begun to begin. 813. One cup of tea. Perhaps I can be as calm. Shiver with the grass stems. 816. I have just come in. 818. Owl in the night. Well that's it folks. Hope you have enjoyed. Be well. Be happy. And don't be silent.